La Buona Stella is a Napa Valley property furnished in European country style and surrounded by oleander, olive trees, rosemary and vineyards. The Mediterranean landscaping provides peace and seclusion, yet one can easily walk to the charming village of St. Helena. The 2-acre property is comprised of a renovated main residence atop a stone wine cellar, a guest house, caretaker’s cottage, circa-1890 barns and outbuildings, swimming pool and spa, pool house with shower and changing room, courtyard with fountain, outdoor dining pergolas, lawn, vineyard and extensive fruit trees, herb, vegetable and flower gardens. Among the produce and animals raised at the property are wine grapes, olives, doves, and chickens. La Cascina is the main residence renovated with Tuscan terra cotta tiles, light plaster walls, handcrafted beam ceilings, custom woodwork, imported door and window hardware, and recessed lighting. The comfortable, well-appointed living room and spacious dining area enjoy lovely vineyard views from floor-to-ceiling French windows framed in Italian tapestry fabric. A state of the art Sony flat screen/Blu-ray/Apple TV media system is featured in the living room. Adjacent is a gourmet country kitchen fully equipped with limestone counters, hand-painted cabinets, Sub-Zero refrigerator, Thermador double ovens and 4-burner gas range with griddle and grill, Franke double sinks, Niele dishwasher, trash compactor, commercial espresso machine, Cuisinart, ice cream and yogurt makers, rice cooker, juicer, blender, etc. The bedroom wing includes a master bedroom with bay window over the garden and fountain, handcrafted king-size wood bed, floor-to-ceiling custom closets, s, and lovely European fabrics. The inviting master bath has a Porcher claw-foot tub with European style handheld shower, imported French lighting fixtures, wood wainscoting and garden outlook. The guest bedroom with handcrafted queen size iron bed enjoys lovely courtyard and garden views from French doors to a Juliette balcony. In the den/third bedroom is an entertainment center with TV/DVD, iPod dock, plus an audio system controlling speakers throughout the house, pool, and courtyard. The spa bathroom with steam, rain head and handheld shower opens to the outdoor 7’ square state of the art therapeutic Sundance spa and recently renovated swimming pool. The lower level of the house is the original winery with its Napa stone walls, plus a winery kitchen with zinc counter tops, all appliances and Viking grill, and a Laundry. The guesthouse, il Pollaio, is a charming, converted farm building with large open floor plan, vineyard views, garden outlook, shaded cobblestone patio, hammock and lawn. This spacious building has a sleeping alcove with queen size English iron bed, sofa bed, kitchenette with below-counter Sub-Zero refrigerator, spacious and charming bathroom, Italian wood-burning stove, TV/Apple TV, piano and large walk-in closet. Located far enough from the main residence to ensure its own privacy, the Pollaio is ideal for the occasional guest, or as a quiet study or office. Both buildings are air conditioned and offer wireless internet access; bocce, pétanque, and croquet are provided. Tennis is readily available at nearby courts. The property may be rented for a minimum 30 night stay. Currently, I reside with my family in the Bay Area and have worked in the residential real estate brokerage field for many years. Attending school in France and subsequently living there, I became a Francophile and developed an interest in good food, wine and the beauty of the Mediterranean landscape. I was born and raised in Manhattan, so qualify as a native New Yorker, and have always been drawn to the temperate climate of the Bay Area and the beauty of its surroundings. In my free time, I enjoy cycling, hiking, gardening, swimming, dining and sharing a glass of wine with family and friends I invite up to Napa to appreciate the many pleasures this Valley has to offer. My husband and I were looking for a weekend retreat within close driving distance to the City where we worked, and found the Napa Valley to be the perfect location! We wanted a home that made us feel that we were on vacation, and would be the archetypal Napa Valley experience. We found the property by chance, while touring friends through Napa Valley who were visiting us from Florence, and who named the property "La Buona Stella", in Italian for "the lucky star". It was love at first sight. 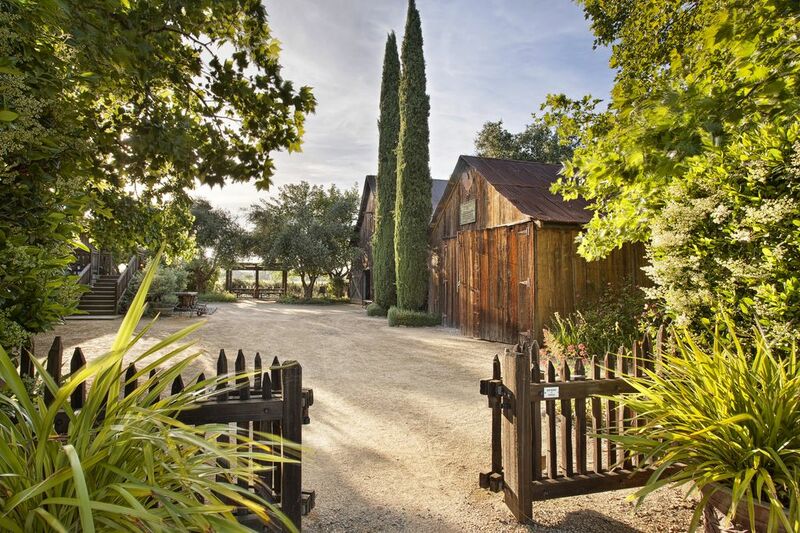 We loved the old barns from the late 1800s on the property along with the existing old Zinfandel Vineyard, outbuildings, chicken coops and magical setting amongst the vineyards spreading out as far as one can see. To the original beauty, we added a 15 year labor of love in the creation of the fountains, and in the planting of the olive trees, Italian cypress, rosemary, lavender, and other Mediterranean plants, and then we renovated the buildings and outbuildings in order to duplicate the settings we adored in the south of France and Tuscany. From the feedback we have received from friends and guests alike, we feel we have achieved a unique compound that offers peace, tranquility, and beauty. Waking up in the morning, and starting the day by walking over to the chicken coop to collect the fresh eggs is only one of the many unique features of the property! Ending the day sitting in the soothing outdoor Jacuzzi with therapeutic jets under the stars, and overlooking vineyards as far as the eye can see, is another magical moment. My friends and guests have often commented on how much they enjoy the rural quality of the compound, the extensive vegetable and herb gardens, the many varieties of fruit trees, including 5 varieties of fig trees, and the ability to create a meal just from the bounty of the gardens. In addition, the many outdoor sitting areas create the feeling of "outside rooms" providing quiet and seclusion, yet one is only a very short walk to the charming town of St,. Helena, with its European style cafes, exceptional state of the art movie theater, The Cameo, and numerous exceptional restaurants.. The property is in the very center of the Valley, on the Valley floor, so one has access to the any of the almost 500 Napa wineries, and world renown restaurants within a short drive. As we are sensitive to the traveler visiting the region, the house and the guest house are very well equipped with books and reading materials of every type, describing all the amenities and features the Valley has to offer. The words "sanctuary", "magical oasis" , "a combination of luxury and simplicity", have all been used by my guests to describe their experience at La Buona Stella. And most importantly, I have been told and concur that , "when you pull up the driveway, you know you are on vacation..."
In addition, there is an enclosed pool house with dressing area and ,private outdoor shower located by the swimming pool, with hot and cold water. in courtyard surrounded by olive trees. Thermador with double ovens, one gas, and one electric. Grill and griddle plus gas burners. Nespresso, Coffee maker and a Professional Italian espresso machine plumbed into the wall. HIgh end kitchen, with limestone counters and butcher block island, with vineyard views. There are several public courts within walking distance. recently renovated with market umbrellas, outdoor dining table under pergola by entry to pool, and teak outdoor lounges. State of the art, new high end Sundance spa, overlooking the vineyards. Working Vineyard and Farm with many breeds of chickens, rabbits, doves. Herb Garden, Vegetable Garden, 20+ varieties of fruit trees. 15-minute walk from St. Helena.